We specialise in making bespoke picture frames, hand-finished with traditional methods of gilding, veneering and paint-finishing, and using only conservation friendly materials. Our workshops are on-site, thus our experienced team are on hand to offer advice and guidance on the design of frame to best complement your artwork, and preserve its value. As well as an extensive and unique choice of mouldings, which can be adapted and combined to suit most requirements, we have a range of metal frames and can also provide acrylic box frames. 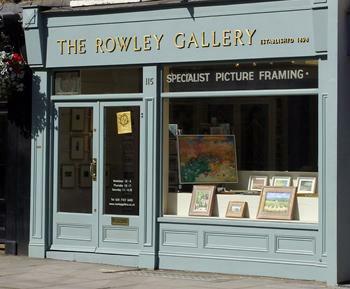 Our gallery shows a mixed selection of contemporary paintings and prints. Gift vouchers are also available. We welcome enquiries so please contact us for more details. We will be closed on Saturday 4th May and every alternate Saturday.